Custom made blinds are an affordable and stylish way to add privacy and temperature control to houses, units and apartments around Perth. They work seamlessly with your interiors and give a sleek modern look. 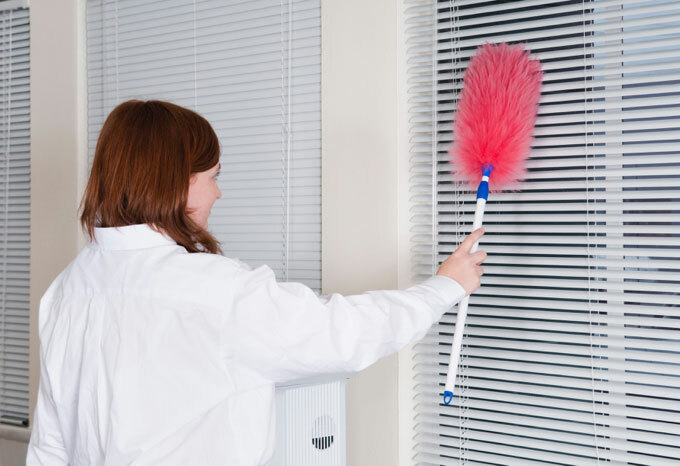 Cleaning blinds is easy, but needs to be done regularly for the health of your home and everyone in it. Whether wood, faux wood, fabric, vinyl or aluminium, if you want to know the right way to clean your blinds, CurtainWorld can help. Bathroom blinds can be cleaned the same way as kitchen blinds. During Perth winters the dampness and lack of sunshine can contribute to mould on faux wood blinds, but a white vinegar and water mix will easily get rid of it. Avoid fabric or wooden blinds in the bathroom, as they can warp and absorb moisture. Faux wooden and wooden blinds will need to be dusted regularly with the soft brush attachment on your vacuum cleaner. Close the blinds and gently vacuum each side on the lightest suction setting. To prevent dirt from building-up, wooden blinds can be treated with a quality furnish polish, sprayed onto a soft cloth. Dust with a duster or a dust attachment on your vacuum. Vacuum fabric blinds, including blockout roller blinds and Roman blinds, to remove dust. Spot treat marks on fabric with an all-purpose spray cleaner and damp cloth, and use a dry sponge (or rubber sponge) from a hardware store to remove stubborn spots on vinyl vertical blinds. If they become heavily soiled, the best thing to do is have them professionally cleaned. 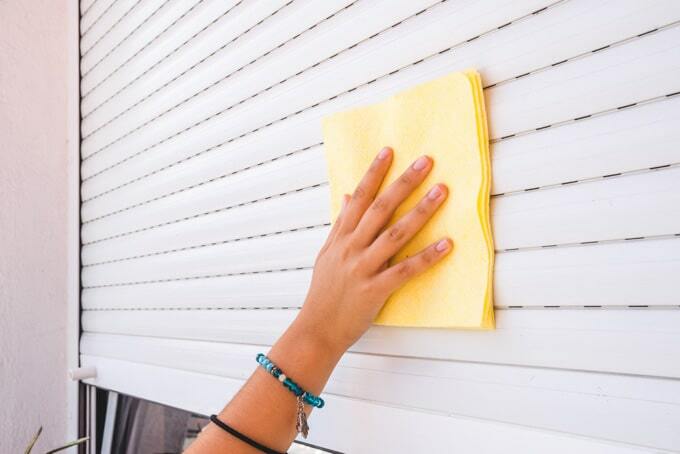 Vinyl or aluminium blinds in wet or dry areas are easily cleaned by gently vacuuming and then wiping with a soft cloth. If they become heavily soiled, take each set of blinds down and wash them in the bath with a mild detergent and a soft sponge. Rinse with clean water, lay the blinds on towels to soak up excess water, then hang to finish drying. Don’t open the blinds until they are completely dry. Cleaning your blinds is an important part of maintaining a sustainable home. We recommend dusting your blinds regularly, and then giving them a good clean once or twice a year. For kitchen and bathroom blinds that have gotten damp over winter, a spring clean on a sunny September day is ideal. Make sure your blinds are sparkling before you move out of a rental, after renovations, or when you’re preparing to sell your house. Clean blinds can make a huge difference in the overall appearance of your home and give you an edge on the Perth property market. Regularly cleaning your blinds will remove dust, dust mites, bacteria, and mould that can be dangerous to your health. No one wants to live among pollutants and allergens, especially when asthma or allergies are an issue, so it’s a good idea to maintain your blinds before they start causing problems. Regular cleaning is also a chance to keep an eye out for damage. You’ll be able to spot when your blinds are near the end of their life, and replace them before they become unsafe. If your blinds are damaged or can’t be redeemed with a good clean, you may choose to upgrade them. WA-owned-and-operated CurtainWorld has extensive experience in helping customers choose styles and designs that complement their home decor. Visit our Perth showroom or book a private in-home consultation to find the perfect style for your home. How do you keep your blinds clean? If you’ve got any handy hints that make blind maintenance an easy part of your routine, post them to our facebook page and we’ll share our favourite advice.